Plus Tips for Estimating and Planning Your Wedding Costs! For the newly engaged couple, establishing a wedding budget can be one of the most stressful parts about planning a wedding. Money can be a source of anxiety for many couples, and with the average cost of a wedding climbing closer to the $30,000 mark there seems to be more reason than ever to stress over the wedding budget. Too often going over budget for a wedding can lead to tension between family members and even the engaged couple themselves. A realistic wedding budget can be the most useful tool for enjoying your wedding planning and avoiding stress in the process. Deciding on a wedding budget total arbitrarily, without educating themselves on what their "dream wedding" might actually cost. Budgeting after you've already started spending money will almost always create stress and a sense of regret. Perhaps you booked a venue and only later realized it's taking up way to much of your wedding budget, or you hired a cheaper DJ only to realize you had the money for the live band you really wanted initially. Similarly, it is foolish to decide that you have to spend exactly $28,000 or close to it because you read that is the national average cost of a wedding. 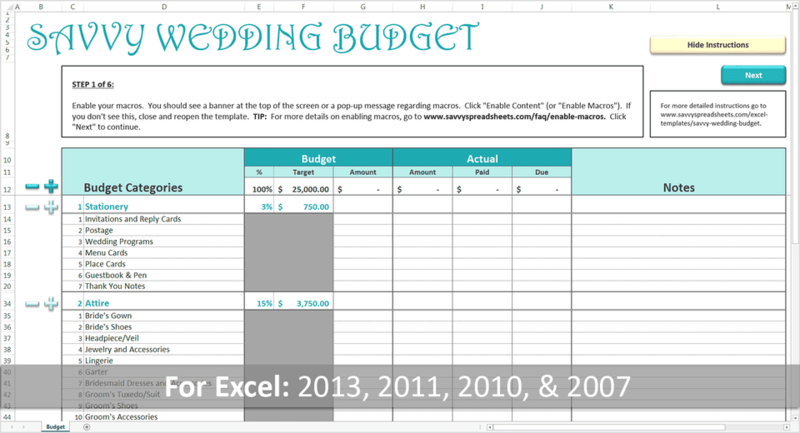 Setting a wedding budget based on averages rather than your own personal financial situation is a recipe for frustration. But have no fear! Here are two ways to create a truly realistic wedding budget. We say that someone is “backing in” to a budget when they know from the very beginning that they have a fixed amount of money to work with. Maybe your parents have gifted you a set sum, or you have a certain amount saved that you have in mind to spend on your big day. First, decide if the dress is part of that amount (I suggest you omit the dress and honeymoon from your calculations). Then take what you have and divide it by the number of guests you think you will have. Then, take your per person figure and divide that by half. You now have two magic numbers for your wedding. The first is 140pp, which is the number that you can spend for Venue, Catering, Staff, Alcohol, Tables, Chairs, Rentals as well as tax and service on the all of the above. If you are looking at a venue where everything is included, you’ll want to be sure that the figure is about $120 or so per person before the tax and tip. If you are looking at a “raw space” venue, don’t book the venue until you have gotten estimates on food and bar, staffing and rentals from a caterer, as you'll want to make sure the sums work out for your total budget. The remainder of your wedding funds will be dedicated to the rest of the day. There are a ton of sites and wedding budget tools for how you can spend the remaining cash, but the truth is you should decide what is really important to you and use that to gauge your budget priorities. If you love flowers and know that you want a live band, you may want to split the rest of that money to Band and Entertainment (about 11%), Flowers (10%) Photography and Video (10-12%), Lighting (5%) Stationery (2.5%), Cake(2.5%), Transportation (1%), Day-of Coordinator (5%) Gratuities (1%) And any surplus should sit in an emergency fund until the wedding is over. Sometimes people really don’t have any idea of what their wedding will cost or what size budget they are really working with for their wedding budget. The most important thing you can do is to talk to your family to figure out who is paying for what for the wedding. If you don't know how much to spend on your wedding, you’re going to have to “Build Up” to your budget. Do some research by browsing websites of venues in your area. It’s almost always easier to get a feel for wedding costs in a given area by calling hotels or all inclusive venues to get a sense of the price per person. Even if you think you want to rent an art gallery or a barn, it’s still good to have a price per person for venue, food, beverage, rentals and staffing to build your budget against. Drop out the highest number and the lowest number and take the average. Be sure to include tax and tip in your calculations. Multiply that number by the number of guests that you are thinking about having and then double that. This is your minimum working budget. We say that it’s a working budget because until you lock in your food and beverage pricing, it’s hard to really say what your budget will be. Also, it is absolutely possible to produce the rest of your wedding for less than 50% of the food and beverage cost, if you're willing to do a bit of extra work yourself. Third, couples who most often go over their budget tend to use the “build up” strategy, which is partially because they tend to spend as things come up vs. sticking to a set amount and working down. Set the budget first, before you start booking vendors or venues. It's imperative that you understand how much things cost in your area. Do the research. Don't worry too much about the national averages, decide what is possible for you depending on your personal financial situation. Be willing to make cuts and sacrifices as needed to fit your wedding budget.